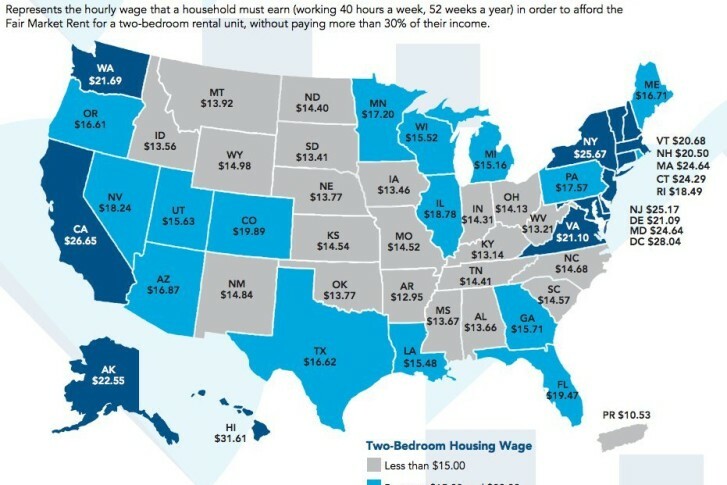 WASHINGTON — To afford a two-bedroom apartment, a D.C. household would need to bring in $28.04 an hour, according to a new report. The National Low Income Housing Coalition’s annual report details how much is needed an hour to pay rent for an apartment with two bedrooms, at fair market value, without spending more than 30 percent of the household’s income across the United States and the District of Columbia. The average fair market rent for a two-bedroom unit in the United States is $1,006. For a one bedroom, it’s $806. The report, called “Out of Reach,” also found that the gap between what people earn and the price of affordable housing continues to grow. On average, renters need to earn $19.35 but for 13 states and D.C. the amount needed an hour to afford a two-bedroom apartment is more than $20. Those states include Virginia, which comes in at $21.10, and Maryland at $24.64. Maryland is one of the states with the largest wage gap between rent prices and how much a renter actually makes. The average difference is $8.93. D.C. comes in just behind Hawaii as the most expensive place to afford a two-bedroom apartment. Maryland ranks 7th and Virginia comes in at No. 11. The federal minimum wage has been at $7.25 since 2009. If the minimum wage rose at the same rate of productivity, according to NLIHC, it would be more than $18 an hour. While some cities and counties have minimum wages above the federal mandated minimum, it still isn’t enough for the average two-bedroom apartment under the report’s guidelines. This includes Prince George’s County, Maryland.